I'm in love with Google Books. Last week over lunch hour at my desk I opened up Google Books and plugged in the search terms, "Botkin" "Indiana" and over on page 2 of the search results I came across an intriguing entry. 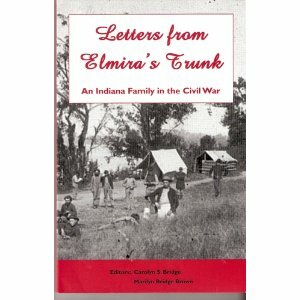 A book entitled Letters from Elmira's Trunk: An Indiana Family in the Civil War. Elmira CATEY SCOTT saved family letters sent from before the Civil War and up until the 1920's. The letters were found in her trunk after her death and have been made into this book. In the biographical index it lists both John and William BOTKIN as being mentioned in the letters. Elmira's brother John CATEY married Mary BOTKIN. Mary's brother was William and I believe John may have been their cousin. Thus my connection to Elmira's letters. Served in the sixty-ninth Indiana Volunteer Infantry, Co. D. Enlisted as a private on August 9, 1862, mustered out July 5, 1865 at Mobile, Alabama. His residence was listed as Trenton, Indiana. According to a letter written by John CATEY in December of 1863, John was the Wardmaster of Ward C at Overton Hospital, Memphis, and had been there since the previous winter. Served in the sixty-ninth Indiana Volunteer Infantry, Co. D. He listed his residence as Trenton, Indiana, when he enlisted as a private on August 9, 1862. He died February 6, 1863. According to a letter written by Eva BRITTAIN, he was buried in the same grave as William ENGLE's son. I don't know anything about John but I do know a little about William. He was born 9 Jan 1842 in Randolph County, Indiana to Peter BOTKIN and Elizabeth ADAMSON BOTKIN. 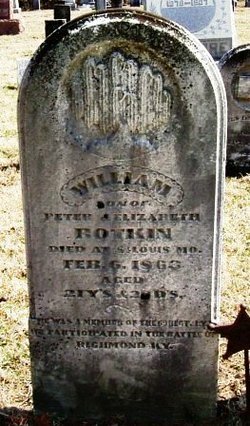 William was the sixth child of Peter and Elizabeth and fought for the Union during the Civil War. William was in the battle of Richmond, Ky., and died at St. Louis February 6, 1863. The cause of death was consumption and he was 21 years old. The letter in the book mentions that he was buried in the same grave as William ENGLE's son but I'm not sure that is quite right. William was buried in Union Chapel Methodist Cemetery in Randolph County Indiana. Buried right next to him is William ENGLE, age 21 years. They are in the same plot but I have my doubts that they are in the same grave. A FAG volunteer has generously posted photos of the stones for both of them. 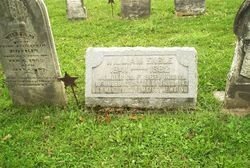 William ENGLE was wounded in the Civil War (Battle of Shiloh). He was a member of the 69th Indiana Regiment of the Volunteer Infantry and died on his way to the hospital in St. Louis, Missouri. As you can see in this second photo, William BOTKIN's stone is right next to William ENGLE. Further reading in this book reveals information on other shirt tail relatives of mine! Reading letters written by soldiers from the battlefield during the civil war has been fascinating! Google Books also led me to an entry for another book entitled "These men were heroes once: the Sixty-Ninth Indiana Volunteer Infantry" by Carolyn S. Bridge This is another book I'd love to get my hands on, however, the closest library to me that has it is Allen County Library in Fort Wayne.